You will find below the horoscope of Julia Channel with her interactive chart, an excerpt of her astrological portrait and her planetary dominants. If you know the time of birth of Julia Channel, we would appreciate it if you would send us your information with your source, at stars@astrotheme.com. To thank you for contributing to the enhancement of our astrological database, we shall be glad to send you the astrological portrait (34 pages) of this celebrity. Horoscopes having the same aspect Venus trine Mars (orb 0°57'): Britney Spears, Catherine Zeta-Jones, Wolfgang Amadeus Mozart, Mick Jagger, Cate Blanchett, José Mourinho, Amanda Lear, Jessie J, Amanda Bynes, Dave Grohl, Michel Berger, Big Sean... Find all the celebrities having this aspect. Horoscopes having the same aspect Sun square Moon (orb 2°04'): Kanye West, Ariana Grande, Natalie Portman, Isabelle Adjani, Warren Buffett, Henry Cavill, Taylor Lautner, Reese Witherspoon, River Phoenix, Eva Green, Michael Douglas, Kate Hudson... Find all the celebrities having this aspect. Celebrities born the same day: Kendall Jenner, Anna Wintour, Charles Bronson, Dolph Lundgren, Roseanne Barr, Aria Giovanni, Jean-François Bernardini, Gemma Ward, André Malraux, Kate Capshaw, Catherine Anglade, Evgeni Plushenko... List of all the celebrities born on November 3. Celebrities clicked on in real-time: 575,954,678 times. Here are some character traits from Julia Channel's birth chart. This description is far from being comprehensive but it can shed light on his/her personality, which is still interesting for professional astrologers or astrology lovers. 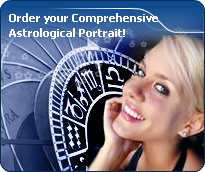 In a matter of minutes, you can get at your email address your astrological portrait (approximately 32 pages), a much more comprehensive report than this portrait of Julia Channel. Warning: when the birth time is unknown, which is the case for Julia Channel, a few paragraphs become irrelevant; distributions in hemispheres and quadrants are meaningless, so are dominant houses and houses' accentuations. Therefore, some chapters are removed from this part. Cheers for communication and mobility, Julia Channel! The predominance of Air signs in your chart favours and amplifies your taste for relations and for all kinds of short trips, whether real (travels) or symbolic (new ideas, mind speculations). You gain in flexibility and adaptability what you lose in self-assertion or in pragmatism. Julia Channel, Fire is dominant in your natal chart and endows you with intuition, energy, courage, self-confidence, and enthusiasm! You are inclined to be passionate, you assert your willpower, you move forward, and come hell or high water, you achieve your dreams and your goals. The relative weakness of this element is the difficulty to step back or a kind of boldness that may prompt you to do foolish things. The three most important planets in your chart are Mars, Pluto and Jupiter. In your natal chart, the three most important signs - according to criteria mentioned above - are in decreasing order of strength Scorpio, Aquarius and Sagittarius. In general, these signs are important because your Ascendant or your Sun is located there. But this is not always the case: there may be a cluster of planets, or a planet may be near an angle other than the Midheaven or Ascendant. It may also be because two or three planets are considered to be very active because they form numerous aspects from these signs. After this paragraph about dominant planets, of Julia Channel, here are the character traits that you must read more carefully than the previous texts since they are very specific: the texts about dominant planets only give background information about the personality and remain quite general: they emphasize or, on the contrary, mitigate different particularities or facets of a personality. A human being is a complex whole and only bodies of texts can attempt to successfully figure out all the finer points. You are the very type of the researcher endowed with great intellectual and imaginative capacities, Julia Channel, and your curiosity is very deep. Researches, riddles and mysteries appeal to you and with a remarkable sixth sense and intuition, you endlessly try to unearth the truth, in all areas, like a psychoanalyst or a detective. You are a very secretive and introverted person, you find it difficult to open up and you rather prefer psychoanalysis. In spite of your clear-sightedness, you find it hard to deal with people: your critical mind, tinted with irony and causticity, may be destructive, especially since your determination and your stubbornness do not incline you to giving up. You are fond of provocations and you handle contradictions skilfully even though you may come across as dishonest. On the affective plane, Julia Channel, you are open, straightforward, spontaneous and you make friends easily because your enthusiasm is expressed jovially, directly and is respectful of well-established moral values. In some cases, you may be opposed to your natal environment or to your family because of your taste for freedom, exoticism or all forms of independence and emancipation. Your feelings are burning and you often get carried away quickly. However, your ability to make friends easily is likely to favour some instability; in order words, faithfulness is not your top priority as long as you have not yet found your soul mate. Ideally, for you, life together must have some degree of mobility and include travels and fresh air. Within your relationship, you need to feel freedom and independence, which you need since your childhood. Under such conditions, harmony and faithfulness can be achieved. Impulsive, impatient, quick and energetic? You? Yes of course, Julia Channel. You are courageous and able to make intense and huge efforts for a short while; and what a terrific rhythm! In sport, of course, or in your sexuality, you are not the type who ponders, you take action instinctively, “in a rough and ready way”. You are outspoken, you do not worry about other people's opinion and you do not allow them to slow you down or to judge you. You must succeed or fall apart. You cannot be bothered with diplomacy or with compromises. You are too straightforward and unyielding to waste time with finesse or shrewdness. This is what makes you charming because, with you, one always knows where one stands. This text is only an excerpt from of Julia Channel's portrait. We hope that it will arouse your curiosity, and that it will prompt you to deepen your knowledge of astrology, as well as to visit and use the wide range of free applications at www.astrotheme.com.